Now that Mega 2018 is behind us, GoSA is looking forward and starting to plan for South Africa's next Mega event. We are looking for your thoughts and ideas on where and when this should be, as well as any ideas to make the next Mega even better than the previous ones, so please share your thoughts and ideas with us through our Mega Survey. We are taking feedback for all of February, so please complete the survey by Friday 1 March 2019 if you want to contribute to the next Mega being the best ever. 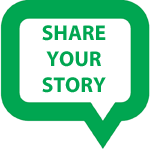 Can you tell us a bit about yourself and what you do at Geocaching HQ? I currently work on making great user experiences for the iOS and Android Geocaching Applications. We use research and data to create a mobile experience that enables people to have an adventure everywhere. When did you start geocaching? I started geocaching about one month before I started working at Geocaching HQ. I found the first one I looked for. At first, the game felt a little silly—why would anyone want to leave their house, get their hands dirty, and poke around suspiciously to find a little container? When I finally found the cache, geocaching clicked for me. I “got” it. I immediately knew why people fall in love with geocaching, and why it’s such a special game. What made you decide to come and visit South Africa? My mom always wanted to go on a safari, so we decided to come here for holiday. I see you’ve travelled extensively (in some of your logs you mention you’ve visited around 30 countries). Which countries have you visited? I’ve been to: Argentina, Austria, Cambodia, Canada, China, Czech Republic, Dubai, Egypt, Germany, Holy See (it counts!! ), Hungary, Iceland, Indonesia, Italy, Japan, Malaysia, Mexico, Peru, Philippines, Singapore, Slovakia, South Africa, South Korea, Spain, Thailand, The Netherlands, Turkey, United Kingdom, USA, Vietnam. My mom loves travelling, so my family makes it a point to travel to new countries every year. We plan to go to Russia next. We see this was your first holiday as a geocacher and Lackey. How did geocaching influence your trip? 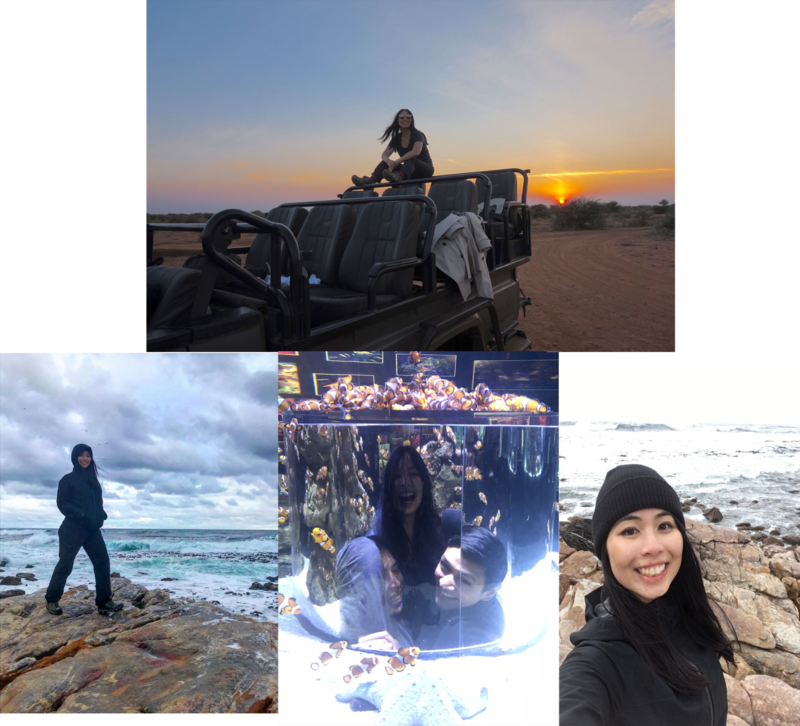 Geocaching allowed me to explore South Africa in a way that felt so personal and memorable. I would wake up early in the morning to find geocaches before the day began. It gave me a chance to have my own private adventures outside of our schedule. Oh, and it also led me to tashas for brunch! What areas did you visit in South Africa? I went to the Madikwe Nature Reserve, Kruger National Park, Cape Town, Johannesburg, and Stellenbosch. We see you found 9 caches – 7 in Cape Town and 1 in both Johannesburg and Stellenbosch. Which was your favourite? Of the places you visited, which were your favourite? The Madikwe Nature Reserve. That safari totally changed me. I feel much more aware and connected to this great big world we live in. It was a really transformative experience. Would you like to visit other areas of South Africa? I’d love to visit the beaches! I would also like to explore Johannesburg a little bit more. I was only there for a short layover (but still managed to get a cache). Anything else you would like to share with our geocommunity? I want to sincerely thank the South African geocommunity for creating this unique space for people to have adventures outdoors. Every day, HQ receives mail from geocachers around the world (our kitchen, named “Signal Café”, has a wall full of them). A huge majority of the letters describe how geocaching has changed their life—either helping them come out of depression, helping them live a healthier lifestyle, helping them cope with grief, helping them spend quality time with friends and family—the list goes on. Hearing these stories makes me excited to come to work every day. I feel very grateful to geocachers around the world for making the world a better place. I also really love droëwors. For those of you who don't follow the Groundspeak Geocaching Forums, one of the South African based forums is the Geocaching Statistics forum. Our local stats guru, Danie Viljoen, has added a whole lot of additional 2018 stats, including most found caches, favourite caches and a bunch of provincial stats too (SPOILER: the Western Cape collected the most favourite points in 2018). Follow the forum from here to see all the interesting info about local geocaching. 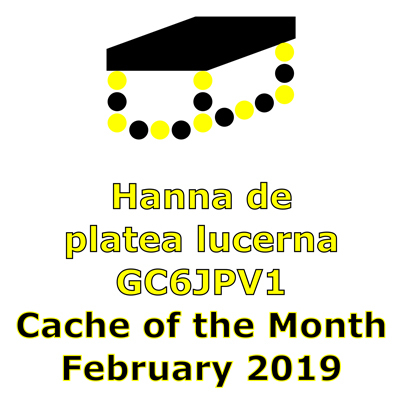 This month's COTM is Hanna de platea lucerna (GC6JPV1). This cache is hidden in the North West town of Vryburg and is a big favourite with 21 favourite points and counting! We trust finding it will be an enlightening experience! March's COTM is again for general nominations. 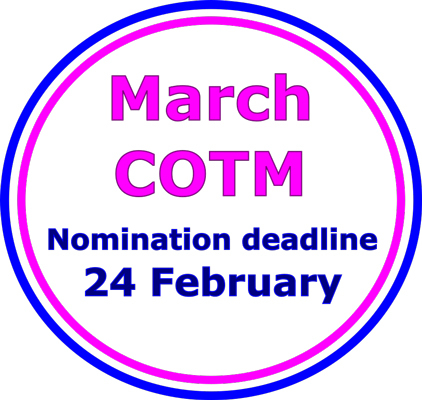 Please nominate any cache that you think deserves the title of COTM. Email your submissions to to .